King Company is a new band and this is their first album, but the Kings behind the Company aren’t young princes. Vocalist Pasi Rantanen and drummer Mirka Rantanen have both played in Thunderstone, keyboard player Jari Pailamo is a former Twilight Guardian, bassist Time Schleifer has played in Jone’s Bros and guitarist Antti Wirman has played in Warmen and Children Of Bodom. A couple of them have even been Heavy Metal dinosaurs, bringing the joyful message of Metal to the younger children. 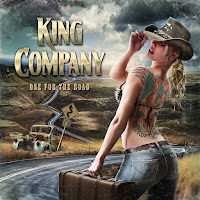 ”One For The Road” is an album of traditional melodic heavy rock in the vein of Whitesnake, Rainbow and Europe. Some of the songs have a bit of a seventies’ vibe, while others harken back to the hairy days of the eighties. My personal favorites include ”In Wheels Of No Return”, ”Wings Of Love” and ”Holding On”, all more 80’ies styled songs I guess… Big choruses and atmospheric keyboards galore! As mentioned before, everyone in the band is a seasoned pro so they obviously deliver great performances. I’m especially impressed by Antti Wirman’s guitar work which is at times really fast and furious yet it never sounds like he’s showing off. I also enjoy the colourful keyboard work by Jari Pailamo.